Everybody’s favorite astronaut has an eponymous iPhone app. Buzz Aldrin Portal to Science and Space Exploration, brought to you by The App Company, is geared toward both young minds and seasoned experts. Despite what my detractors may say, I am not a juvenile, and it goes without saying that I am not a space-industry expert, so I can’t evaluate the app from either of those perspectives. I’m more of an approaching-middle-age mind who’s interested in learning about space exploration. From that perch, I set out on my journey to learn more about humanity’s efforts in space through the eyes and mind of Buzz Aldrin. Deep Space Mine: Most of the action in Buzz Aldrin Portal to Science and Space Exploration can be found in the Space Buzz screen, which contains multiple categories covering the exploration of space. The app is full of information: the amount of it is almost overwhelming, but it’s organized in a way that helps you make sense of things, even if moving through the app requires quite a bit of tapping back and forth from screen to screen. Upon launching the app, you’re greeted with a photomontage of Buzz then (in astronaut gear while on the Moon during the Apollo 11 mission) and now (peering at you from the great beyond), with Earth in the foreground and the Moon in the background. The app takes a little while to load—in my experience, an average of seven seconds. Once loaded, Portal to Science and Space Exploration puts you on the SpaceBuzz screen. There are five main screens to choose from: SpaceBuzz, News, Interactive, Buzz Life, and More. Switching between the main screens is easy, and the response is fast. And if you go from, say, the photo gallery in the International Space Station (ISS) mission section of SpaceBuzz to the background information about the Gemini 12 mission in the Buzz Life main screen and then back to the SpaceBuzz main screen, the app remembers the area of SpaceBuzz you were in before you tapped away. Delightful. Space Buzz is where most of the action is. It features 10 categories, including Buzz’s New & Most Popular, Mars Exploration, Space Tourism & Private Venture, and Mysteries & Myths. 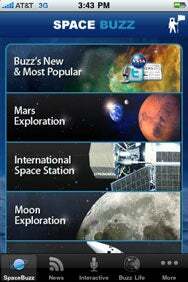 Most of these categories are further split into sections, the most common being Buzz’s Takes (where you can find links to letters and articles Buzz has written about a specific topic) and Roundtable (where you can find info from various experts or a panel of experts discussing certain topics, such as whether the ISS should be deorbited in the year 2016). Both Buzz’s Takes and Roundtable are context-specific in these areas—you get Buzz’s takes on just the ISS in the ISS mission area, for example. Sometimes, there will also be links to video, photos, Facebook pages, and Twitter feeds as they relate to the particular area of the app you’re in. Each category from the SpaceBuzz section runs deep, so be sure to tap around to get acquainted. On the News screen, you’ll see various outlets for news about space. For instance, tap NASA and you get access to NASA TV, NASA Breaking News, NASA Image of the Day, and a host of other news information. But other than NASA, you also get easy access to sites like Space.com, Universe Today, Space Wire, and SpacePolitics.com, among others. Universe Today content in the app was not totally up-to-date, as I found out after visiting the Universe Today Website on my Mac. SpacePolitics.com content from within the Buzz Aldrin app is current, but it’s not dated as it is on its Website, so I had to visit the Website first before I could determine this. The Roundtable articles and discussions, as well as Buzz’s Takes aren’t dated either. I prefer to know when the content I’m reading was written. A minor complaint, but as space technology changes, I want to know I’m always up-to-date. In the app’s defense, however, its description does say it strives to “keep this app timely and relevant with lots of original content.” So perhaps we can take it on its word that all content is timely. 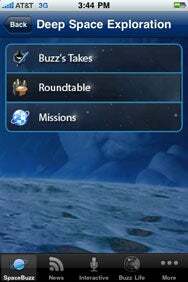 The Interactive section of the app is where you’ll find a full list of Buzz’s Takes, all Roundtable entries, Questions & Answers (you can pose Buzz questions through the Ask Buzz portion of the App—more on this later), Buzz’s Journal, Buzz’s own Twitter feed, recommended Twitter feeds of folks and entities Buzz thinks you should follow, and links to astronaut training journals. The next main screen is Buzz Life. There are quite a few gems in this area. Check out the photo galleries of the Apollo 11 and Gemini 12 missions Buzz was a part of. I saw some images I’d never seen before. There’s also video footage of both missions, onboard audio from Apollo 11, and background information on both missions. What’s the Buzz: Both Buzz’s Takes (letters and articles written by Buzz Aldrin) and Roundtable (info from assorted experts) are context-sensitive to the category you’re browsing. You get to the last main screen by tapping the More button. The notable thing here is the Ask Buzz feature. Tap on Ask Buzz to ask Buzz a question. Fill in your name, e-mail address, and then pose your question. When I tried this feature, it failed the first three times. I started to develop a complex that maybe the app had a lame-question detector and in reality rejected my question and tried to play it off by telling me that it could not complete my request. So I took a break from trying to ask my question. A while later, I typed my question again, tapped Send, and it worked! (Not proof that my question wasn’t lame, but reassurance at least that there’s no need to fear a lameness detector.) Before you start sending Buzz questions with reckless abandon, note these few things about the Ask Buzz feature: iPhone OS’s copy-and-paste feature is not supported in it, and you can’t type your question in landscape view. Both of these things are sort of a drag, especially because I had to retype my question four times before it got sent. When listening to the Are We Alone podcast, linked to within the app, I was interrupted by a Words with Friends notification saying that my ruthless word-slinging co-worker had played a word, and I needed to now play mine. Thinking this was the perfect opportunity to see if I could get back to the same place in my podcast after I entered a new app, I paused the podcast, opened Words with Friends, and played a word. Unfortunately, I couldn’t go right back to where I left off in the podcast—it started again from the beginning. Neither did the podcast pick up again after I answered a phone call I received while listening to it. That was pretty frustrating. (The same goes for video linked to from within the Buzz Aldrin app—if you choose to answer a phone call or enter another app, you won’t be able to easily get back to where you were in the video.) You can’t download the podcasts or videos to your iPhone’s iPod app or your iPod touch’s iPod or Videos apps either. Buzz Aldrin Portal to Science and Space Exploration should be on the iPhone and iPod touch of every person who considers themselves a student of the universe. It has some quirks that I hope get ironed out in future versions. But for $2, you get a wealth of information at your fingertips. And it’s pretty cool to view all this information through the eyes of one of the astronauts who made history by walking on the Moon: No matter how far technology has come since the Moon landing in 1969, the fact is that no human has ever ventured very far beyond our Moon. Changing that is something Buzz Aldrin is passionate about.